24" x 45" Silhouettes used by the North Carolina Justice Academy. Overprinted with a red bullseye and score markings, plus a scoring key and grid. All on 60-lb. paper. Includes 50 targets. Each measures 24"w. x 45"h.
Law Enforcement Silhouette B-27 Targets, 50 Pack is rated 4.8 out of 5 by 104. Rated 5 out of 5 by Slackernomo from Best price I’ve found, anywhere. Excellent targets. These are a must have for practice or qualification purposes. Rated 4 out of 5 by StrongGrog from Good Quality & Great Value These targets are good quality, printed cleanly on medium weight paper. They perform well, not excessive tearing, making for fast and easy scoring. 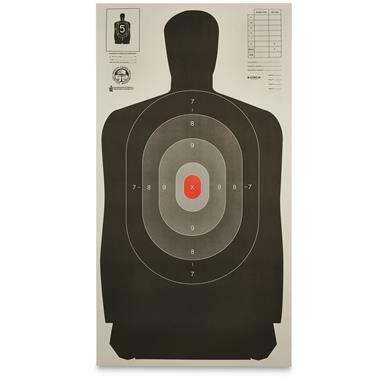 Rated 5 out of 5 by bawana from perfect size have been using these targets for qualification purposes, and competition shooting.The red bullseye helps your aiming,but if shooting with a red lazer sometimes hard to see lazer dot. Rated 5 out of 5 by Bob43 from Good target at a great price The Law Enforcement Silhouette B-27 target is a good training target, made of heavy paper. I use them for practice at a modern indoor range and they hang well. Rated 5 out of 5 by eric the red from Great price I do concealed carry classes and B 27 targets are mandated, these are 1/2 the price of similar. Rated 5 out of 5 by Kenzi from Great targets! Good size target! The gradient angle in the color really helps when you are trying to figure if you are on target. Enter the digital age of shooting.